Bayern Munich president Uli Hoeness has sensationally revealed Juan Bernat's departure from the Allianz Arena was sealed following a poor performance in the Champions League. 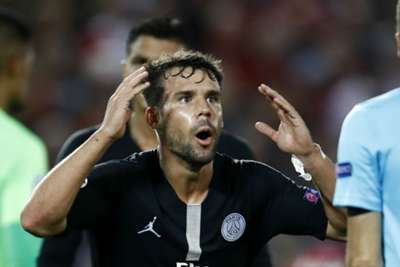 Bernat left Bayern after four seasons in August, swapping the Bundesliga for Ligue 1 after signing a three-year contract with Paris Saint-Germain. The Spain international's departure came as something of a surprise given he had made 113 competitive appearances for Bayern, winning four league titles. However, his exit was settled after a miserable opening 45 minutes in Bayern's Champions League quarter-final first-leg clash with Sevilla in April. Bayern eventually won the game 2-1 and went on to reach the semi-finals, but Bernat's first-half display saw him substituted at the interval. The Bayern board were so disappointed they decided to sell the 25-year-old. Speaking at a media conference on Friday, Hoeness revealed: "When we played in Seville, he was solely responsible for almost eliminating us. "That day, we decided that we would sell him. Because he almost cost us all the success in the Champions League."